You mean something that catches the attention of others. The best way is through Twitter, but if you write it in original form, now we have something to propose. 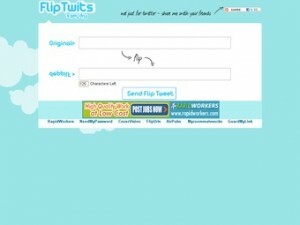 It FlipTwits online application, which allows you to send the message you want, except that the letters are all backwards, making it more interesting and, above all a challenge to read. To create your message in reverse, just need to write in Web FlipTwits and can send it directly from there, as it connects to your Twitter account, for which, of course, need your permission. FlipTwits is an excellent way to add a playful and original touch to the messages of 140 characters, which look now exited the world upside down, giving an interesting option to all those who read.